Our maple syrup adventure is finally winding down. 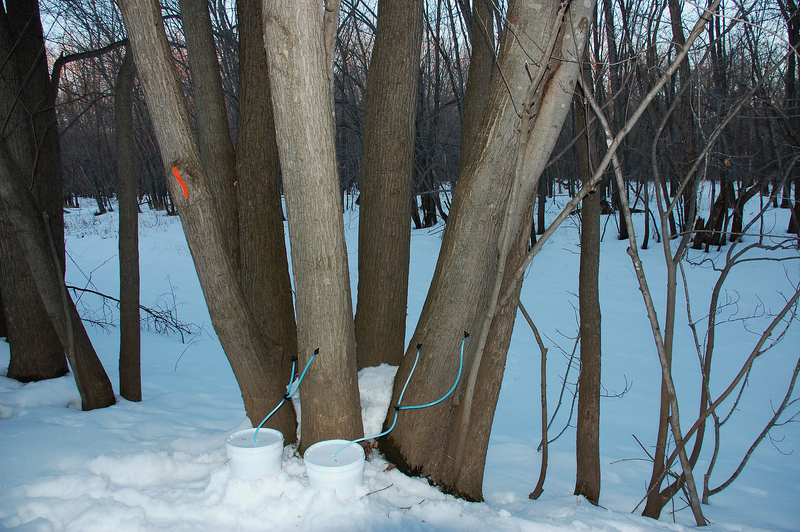 The sap reluctantly started to run last weekend after the night-time temperatures started dipping below freezing. By all accounts, this year has not been a great sap run because of the warm temperatures. 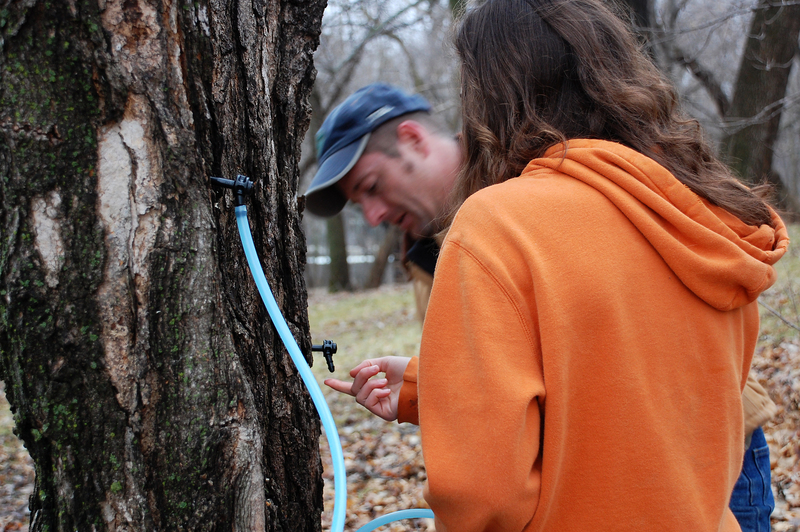 We decided to tap more trees along the river once the flood waters receded to increase our quantity of sap. It was time to start collecting sap last weekend and everyone wanted to get involved. We have a large water tank that we put on our ATV in the summer to water trees. The tank functioned well as a collection and holding tank for the sap. Below the boys are emptying sap into the tank. Prior to building our smokehouse last year, Jesse used a home-made barrel smoker and an electric smoker to do all of his food smoking. These styles of smokers limited him to hot-smoking, which is a process that actually cooks the meat slowly while smoking it by keeping temperatures above 150 degrees F.
Cold-smoking is an entirely different process that involves keeping the temperature during the smoking process somewhere below 70 degrees F. The primary reason we built our smokehouse was to be able to cold-smoke the traditional German sausage that Jesse’s family has been making for years. 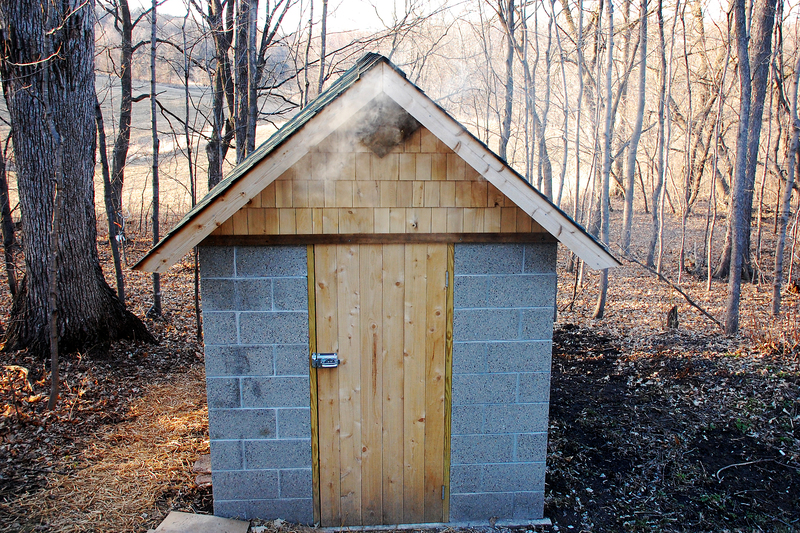 The large size of the smokehouse is because Jesse wanted to have the capacity to smoke 400-500 lbs of the sausage in a single batch instead of staying up nights tending the firebox. A nice side benefit is that he is also able to cold-smoke fish, cheese, ribs, chickens, turkeys, etc… which turns out a completely different product from hot-smoking. The key design criteria for cold-smoking is to locate the firebox away from the smoking chamber to allow the smoke to cool before entering the smoke chamber. 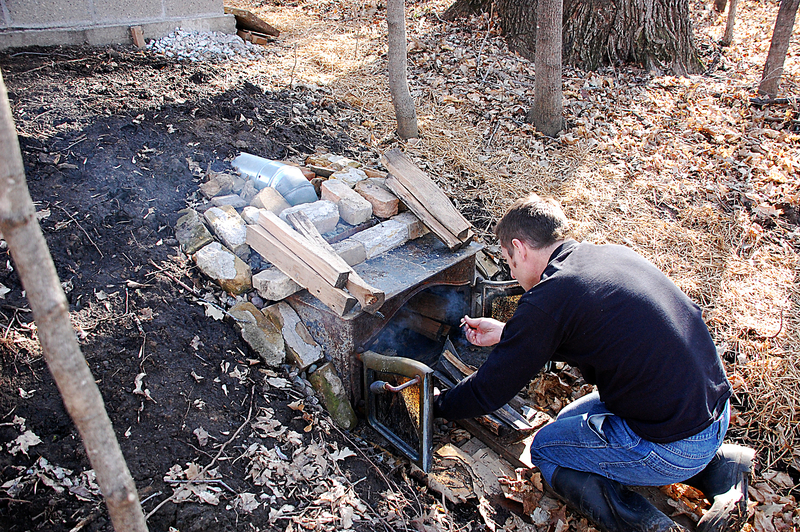 In Jesse’s design he has located the firebox 8 feet away and slightly down the hill from the smokehouse. The firebox and flue are built into the hillside, which allows the heat to be pulled out by the cooler soil temperature. It is also important to make sure that the flue pipe is at a slight incline to encourage proper drafting of the smoke from the firebox into the smokehouse and out the roof venting. Adequate venting is important to make sure that moisture does not build up in the smokehouse. Jesse cold-smoked some salmon last weekend. It was his second attempt and the texture and flavor turned out much better this time. The first attempt was with refrigerated salmon with no skin attached. The second attempt was with frozen wild salmon provided by a co-worker. We have found some information that frozen salmon is actually preferred for cold-smoking because it enables the curing process. 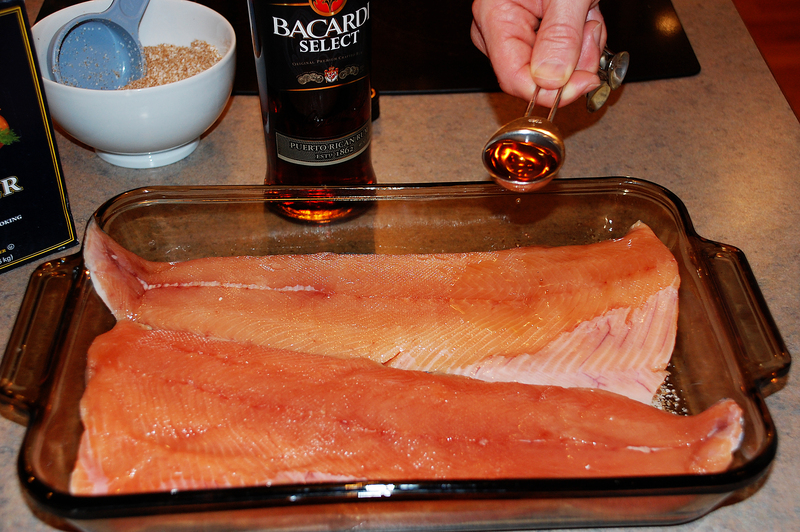 Before cold-smoking, the salmon needs to be thawed and cured. Curing preserves meat or fish with salt. There are endless variations of curing recipes, but the dry cure recipe that Jesse used this time was from Charcuterie; The Craft of Salting, Smoking and Curing. This book provides a wealth of information on these topics and has been an invaluable learning resource. 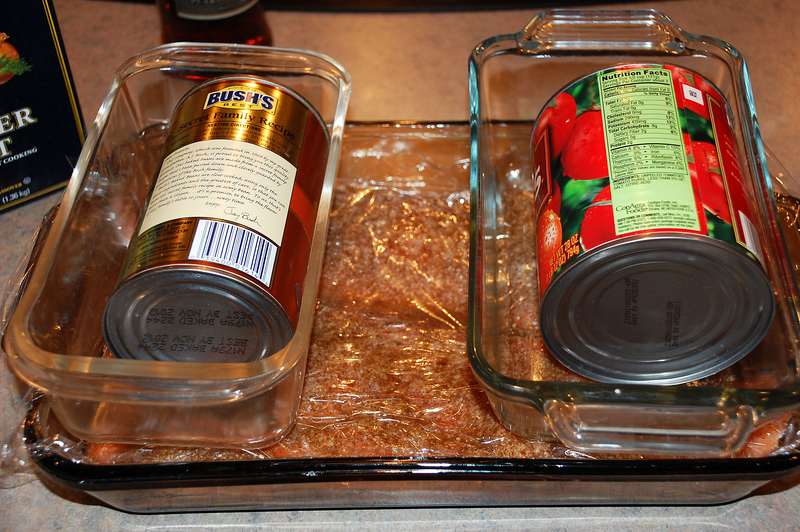 After mixing all the dry cure ingredients together, spread half of the mixture out in a dish or pan. It is helpful to choose a dish that is around the same size as the salmon fillets because the curing process extracts liquids out of the fish. Having a dish around the same size allows these liquids to remain in contact with the fish and becomes a natural brine for curing. 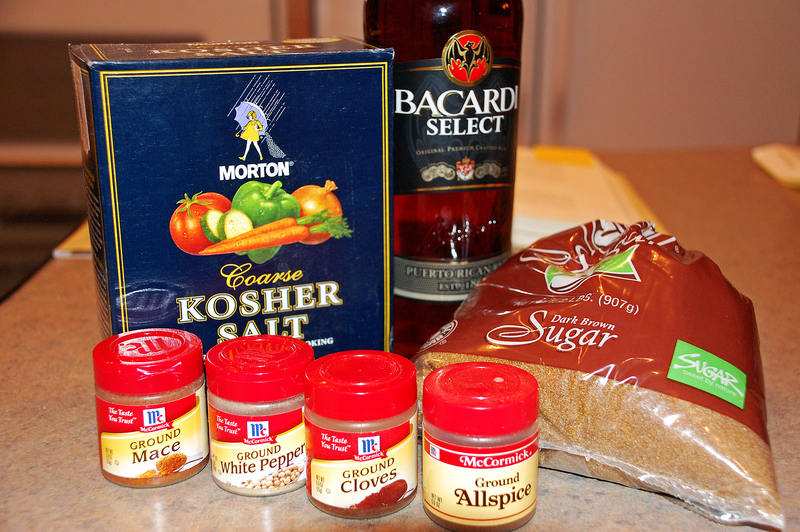 Time to sprinkle on the dark rum and add the rest of the dry cure mixture over the top. Make sure to sample the rum during this part of the process to make sure it is of good quality. 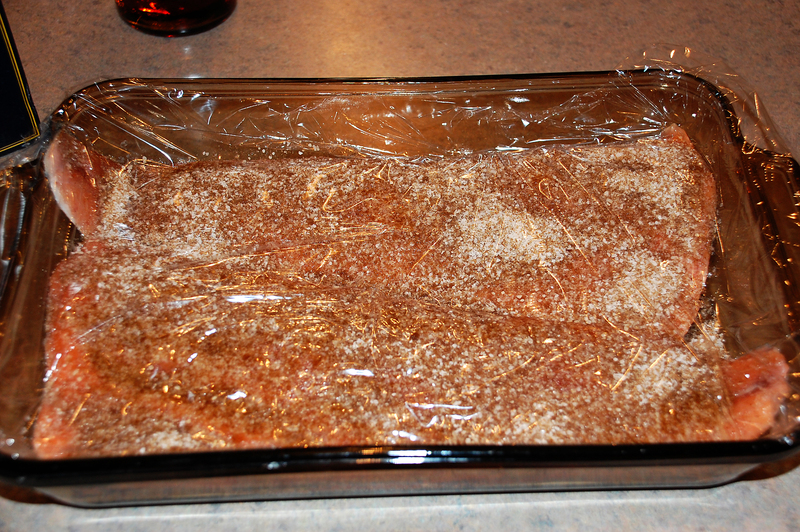 Once the salmon is covered with the remaining dry cure, cover it with plastic wrap. Sample the rum again, just to be sure. Place a pan (or pans) on top of the salmon and put some type of weight in it to help extract the moisture. We used cans and a dressing bottle in between for weight. Now it is time to put it in the refrigerator and let the curing process begin! 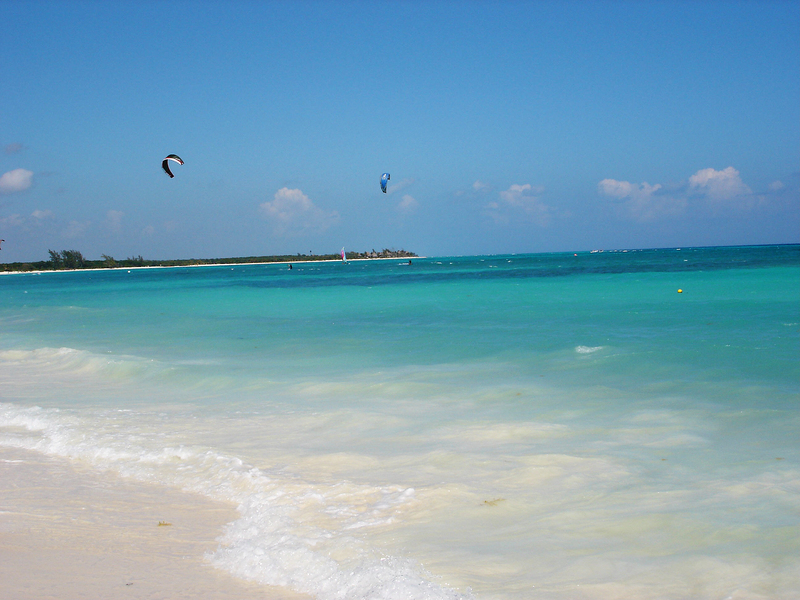 It wouldn’t hurt to sample the rum again for good measure. Jesse let the salmon cure for about 36 hours. You can tell when the curing process is complete because the salmon will become firm. 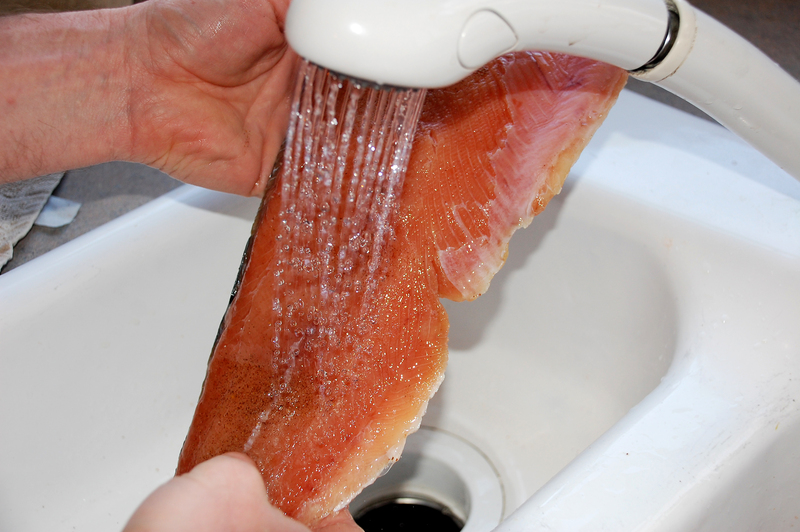 Once it is finished curing, it needs to be rinsed thoroughly under cold water to remove the excess salt. After patting it dry with paper towels, we placed it on a rack out on the screen porch to dry. 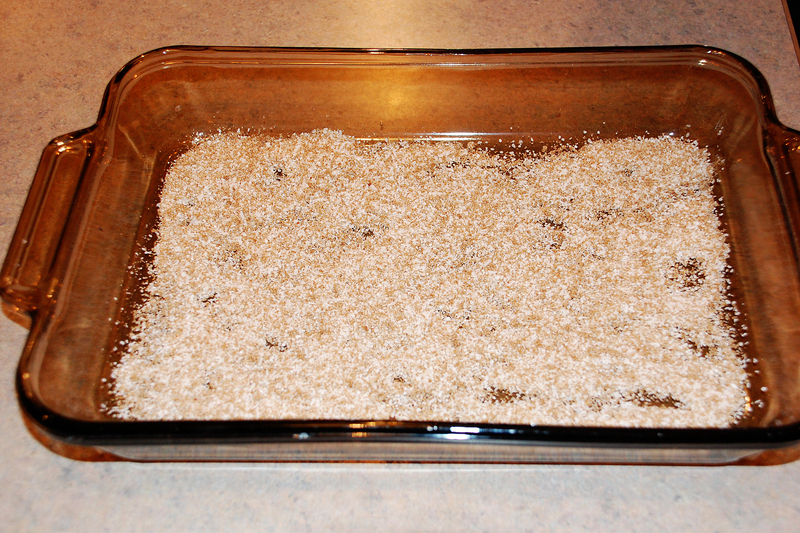 Drying is also an important part of the process because it allows the food to form a pellicle. The pellicle refers to the tacky surface that develops when food is dried and to which the smoke sticks, thereby adding the desired flavor. 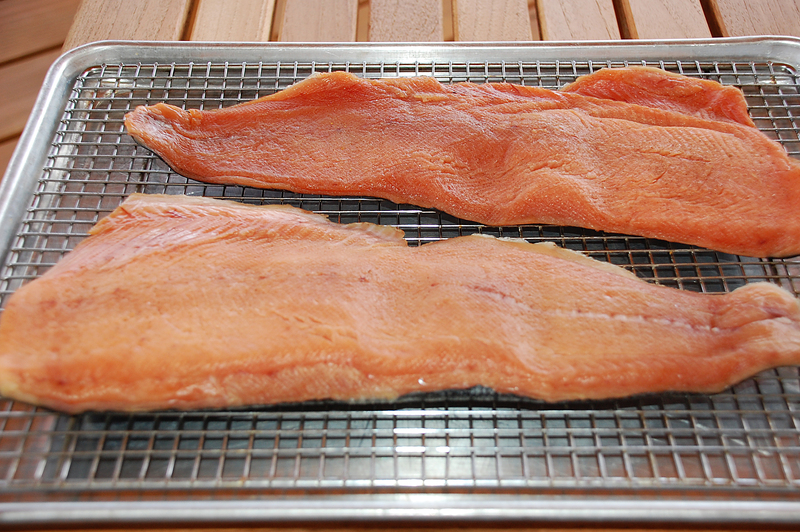 We dried the salmon for about 6 hours, but it could dry cure for up to 12 hours if needed for pellicle formation. It’s finally show time! Time to fire up that smokehouse. 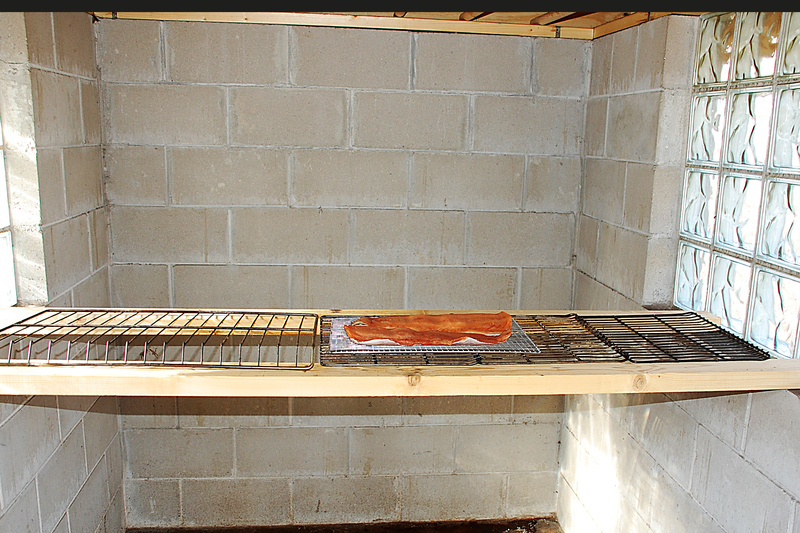 Jesse used maple wood to smoke the salmon. His first attempt was with oak wood because he forgot he had a whole tree worth of maple sitting behind the garden. The maple wood had a much mellower flavor that we enjoyed. I could not resist poking fun at these two little salmon fillets taking center stage in this ridiculously large smokehouse, but Jesse reminded me that the operating costs were still zero since the wood was stacked head high from a downed tree in the woods. We thought the salmon was too smokey last time after being smoked about 6 hours, so this time he only smoked it for about 4 hours. Just about the right amount of smoke for our tastes. After all the work that went into building the smokehouse, it is fun to see it get some use (even if it only for two measly slabs of salmon). The finished product! 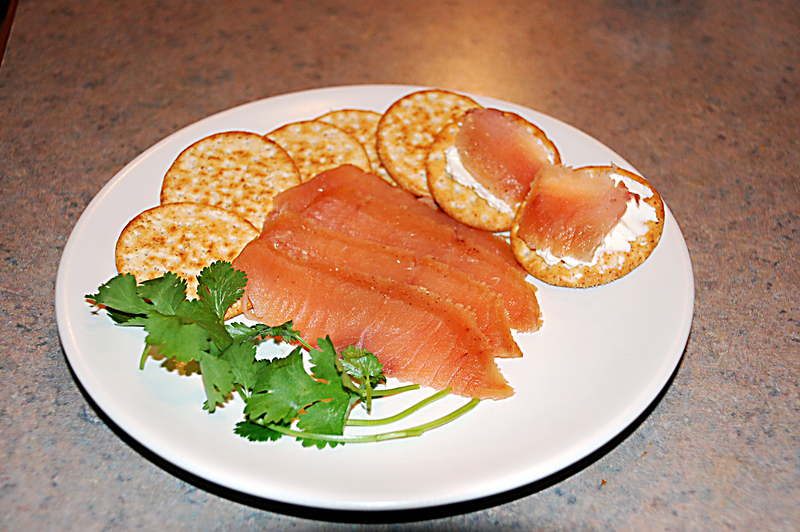 I think it is best on a cracker with a thin layer of cream cheese. The smokey flavor was perfect; not too overpowering. Jesse will fine tune this recipe with some fruit woods in the future, and he has promised to also work harder to remove ALL the pin bones next time! March has been unseasonably warm so far this year (although it sounds as though temperatures are expected to return to normal by the weekend). With temperatures sneaking into the 60’s several days already, the snow has completely melted and signs of spring are everywhere. 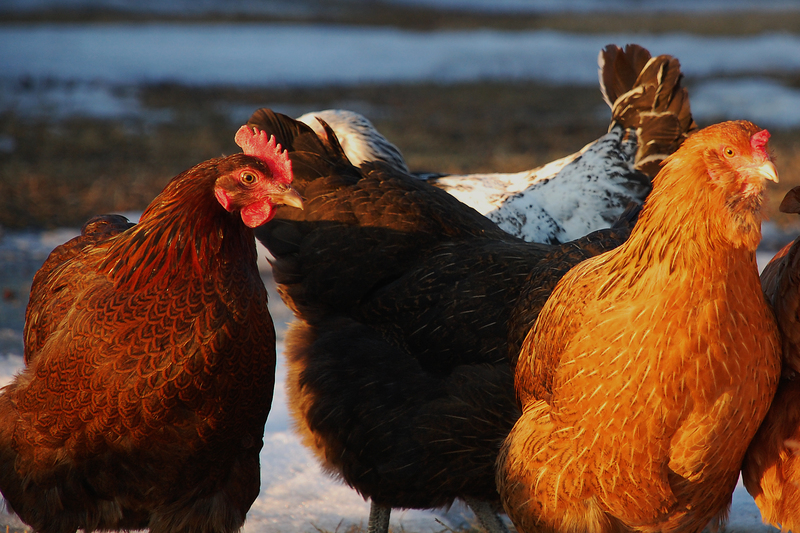 Generally speaking, I welcome the signs of spring. It means that soon I will be back in my flower and vegetable gardens. Over the weekend I found this little gem in the flower garden in front of the house. It was such a sweet surprise and reminder of spring. 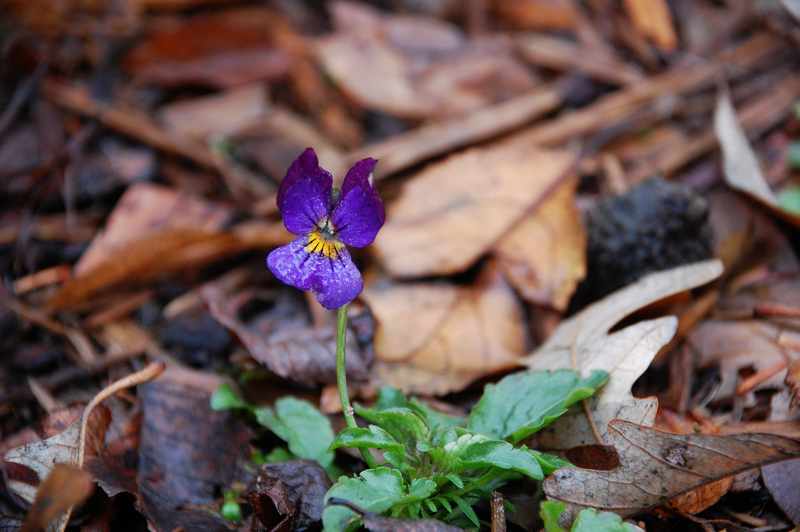 This lone violet was the first sign of life in my perennial garden. 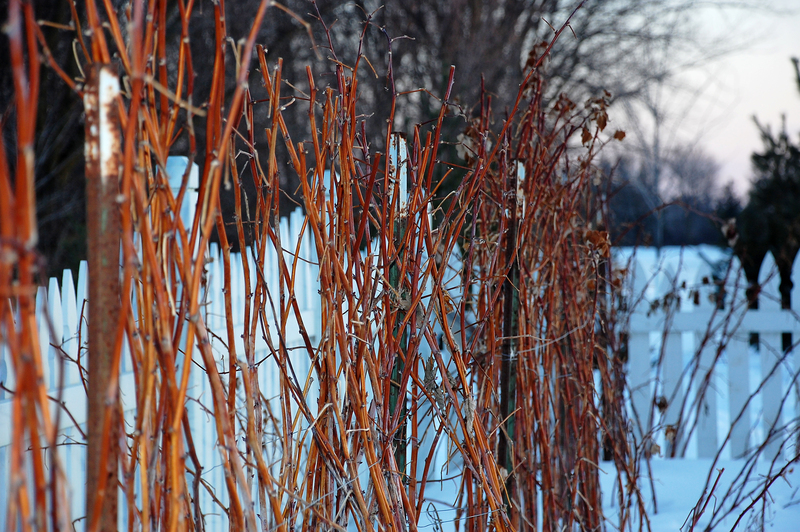 The last few warm days have brought other perennials out from their winter sleep. Seedum and Ajuga intertwine here. 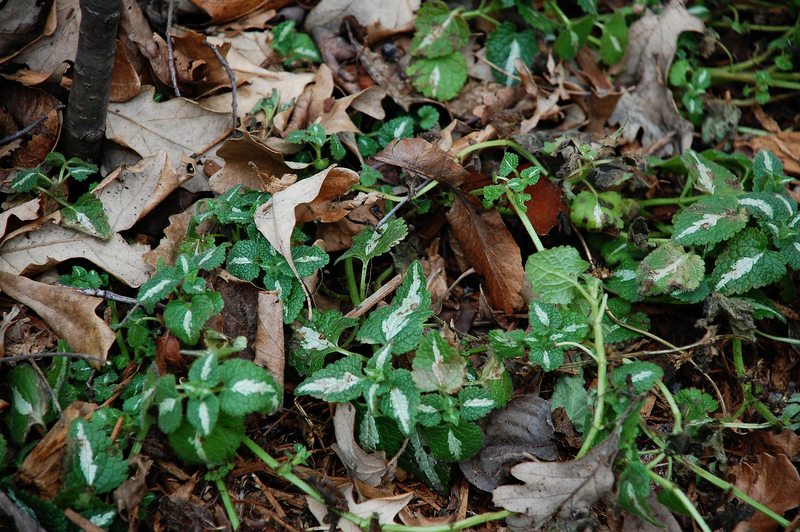 A volunteer Lamium plant also has greened up under the shrubs by the house. Even the vegetable garden is showing signs of life. 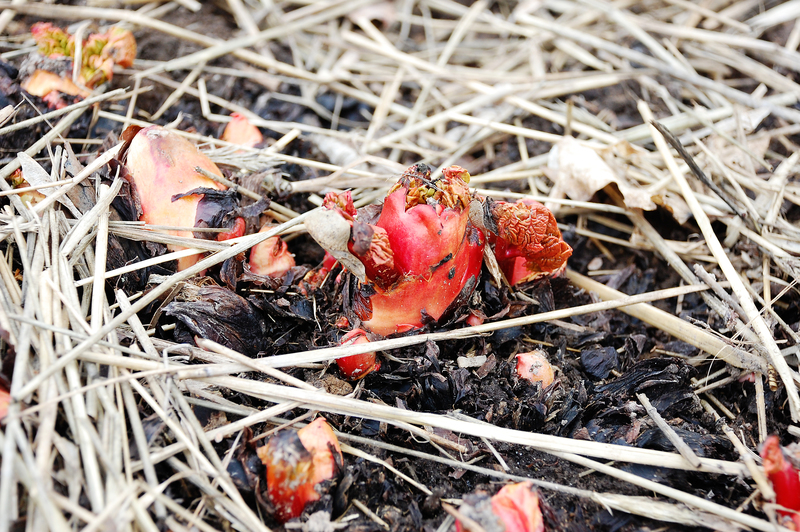 The rhubarb plants broke through the ground in the last few days. I think their appearance is premature and I’m a little worried about how they will fare when the cold weather returns this weekend. They are tough plants though and will likely recover quickly from any setbacks. 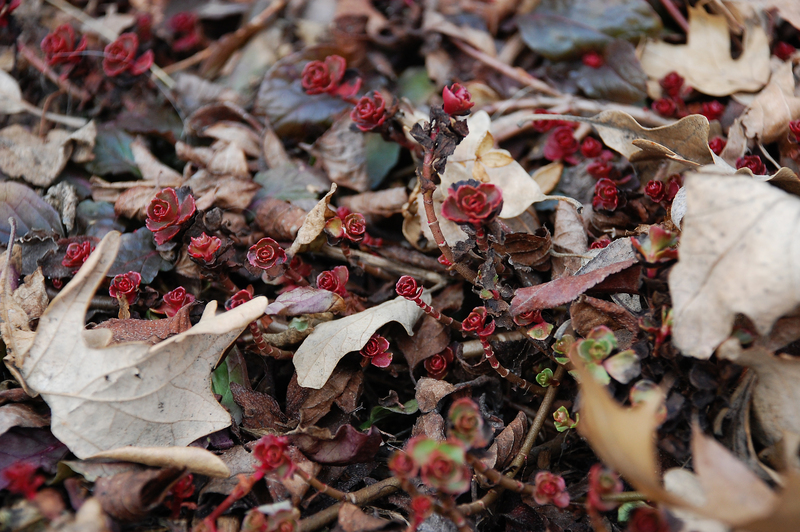 Along with the lovely perennial plants and vegetables, some unwelcome signs of spring have also appeared. DANDELIONS are already popping up all over. This Stella de’Oro daylilly is fighting for space with this huge dandelion. Dandelions and grass have also showed up among my peonies. I am not opposed to using herbicides on these rogue weeds and hope to eliminate them before the flower plants get much bigger. 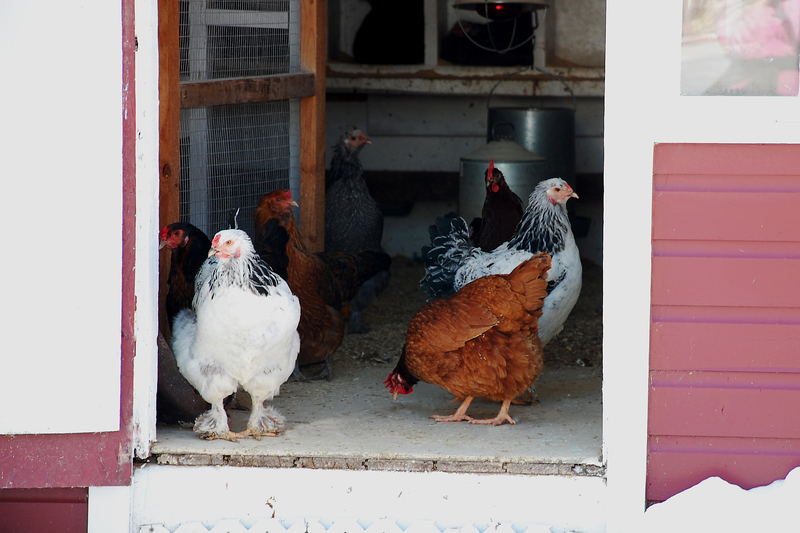 It is time to get out the Roundup and blast these pesky weeds. I need to wait for a calm day, however, so I don’t kill my flowers. 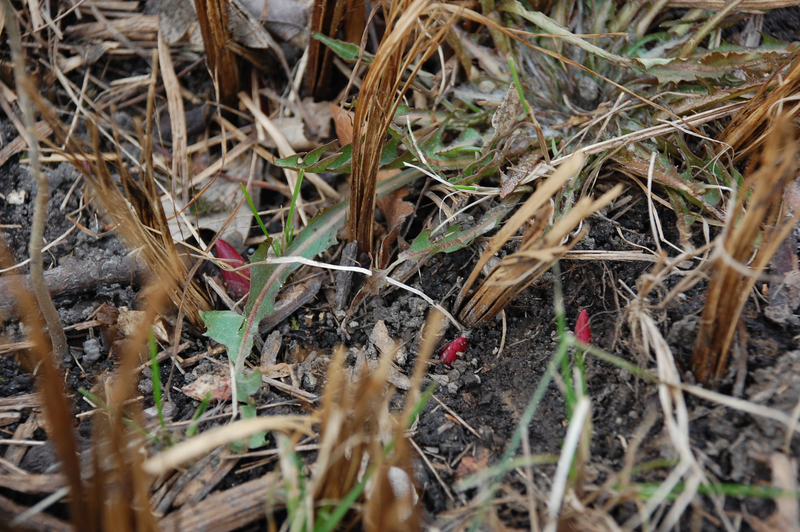 And this weed…it is all over in my bed of peonies and I’m not sure what it is. It used to grow in abundance in the cow pastures when I was growing up, but I don’t know the technical name. Any ideas? It also needs to go. 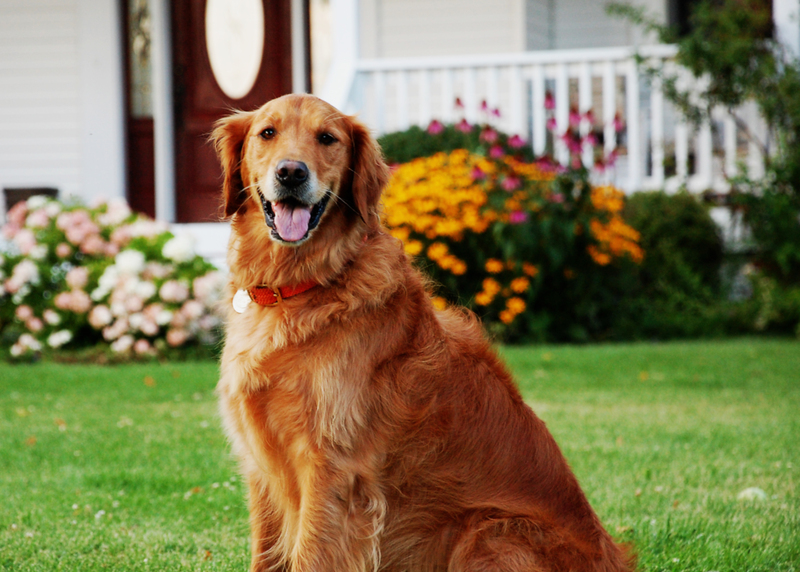 Spring time also brings a reminder that we have a dog. 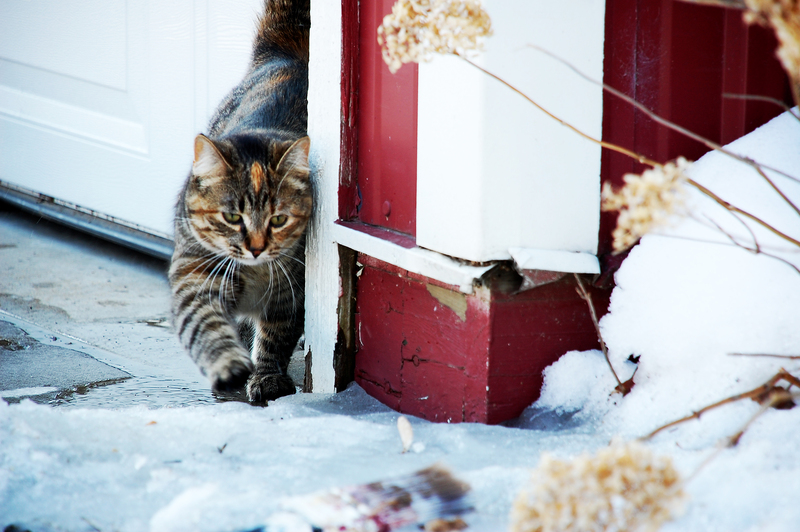 Our dear Sofie, that we enjoy in so many ways, definitely manages to leave her mark from her quick trips outside the house during the cold winter months. 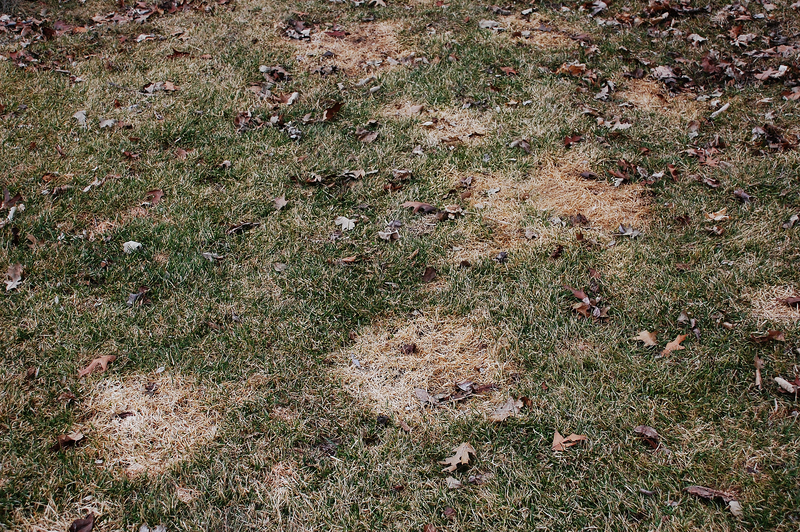 In contrast to the healthy green lawn that she graces above, is the spotted lawn that appears every spring. This spring is no different, and we will need to re-seed these areas. 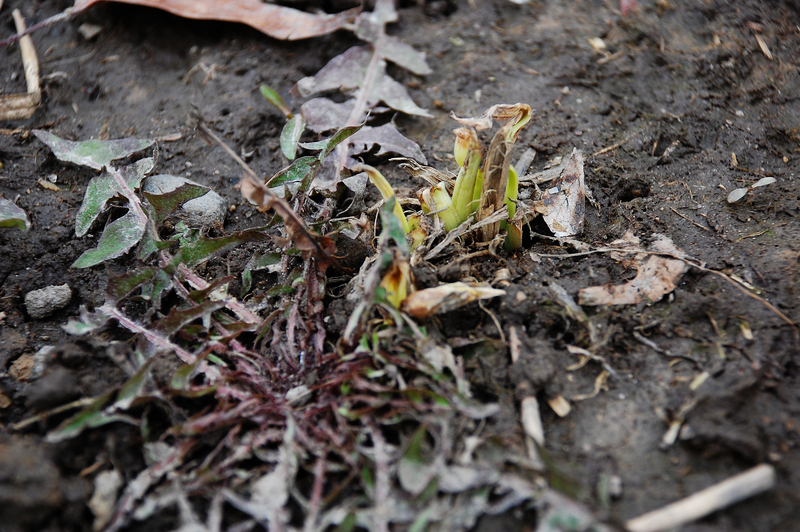 The weeds popping up all over and the dead spots in the lawn are the frustrating signs of spring. 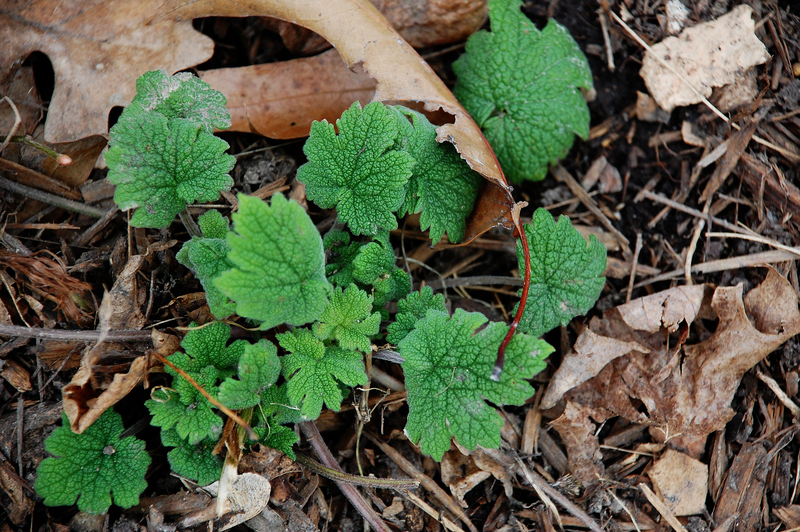 But my excitement over the perennial flowers and vegetables that are appearing easily outweighs these irritations. I am ready to get in the dirt and start gardening. Unfortunately, it is only March! 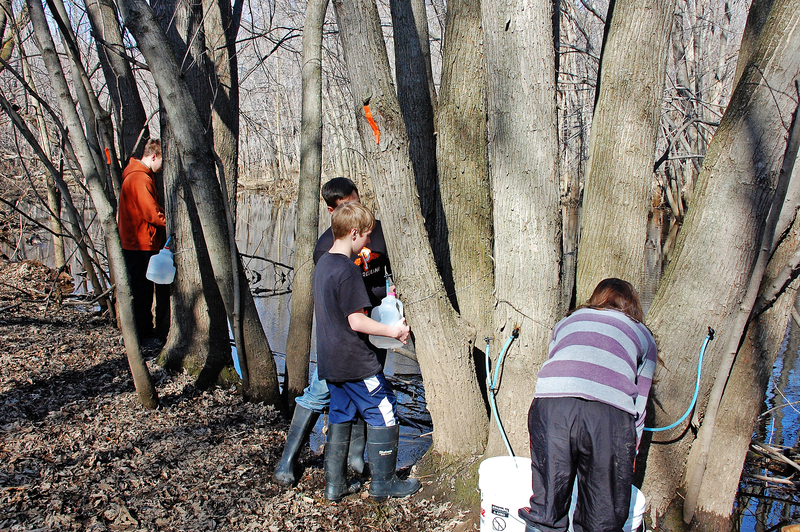 Remember last week, before we left for our trip, when we tapped a few of our maple trees in the river bottom behind our house? 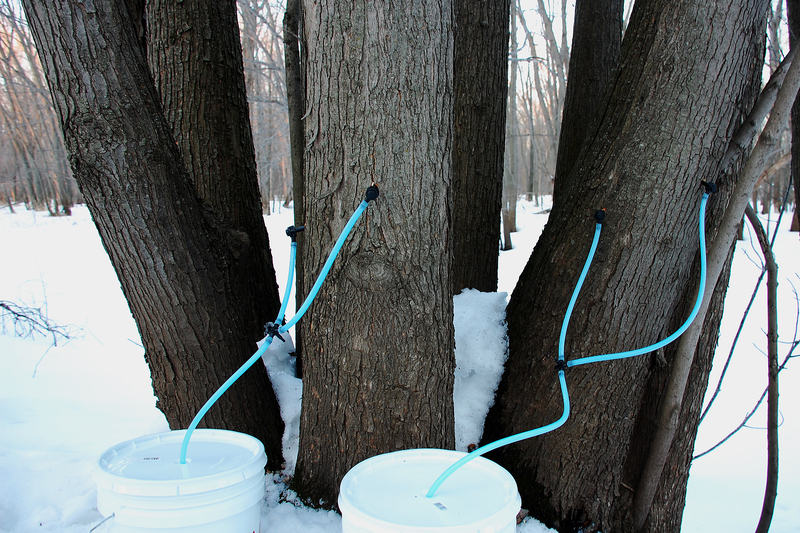 The pails sat safely next to the base of the trees, waiting to catch the sap when it starts to flow. Apparently it rained nearly the entire time we were gone. It rained a lot and the snow melted…a lot. 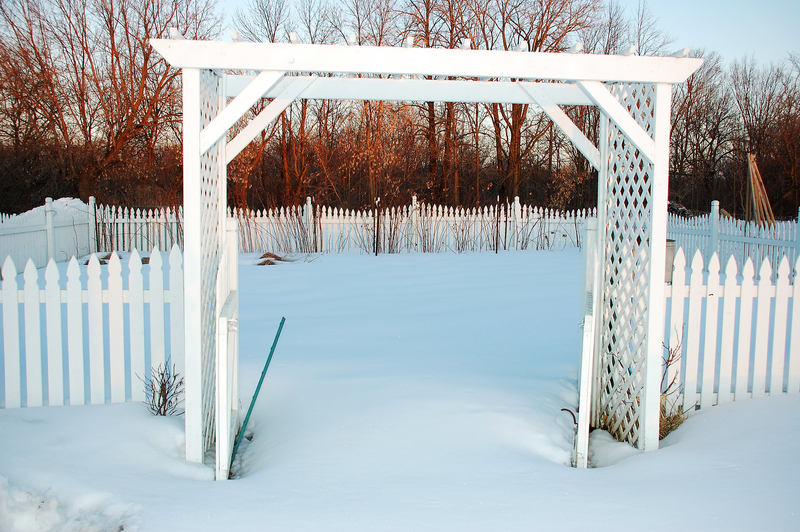 We arrived home Thursday night surprised to see how much of the snow was gone. It was still raining on our drive home from the airport. It was evident that winter was on its way out and the dreariness of spring was upon us. In the morning, I glanced out the windows in the back of the house towards the river. 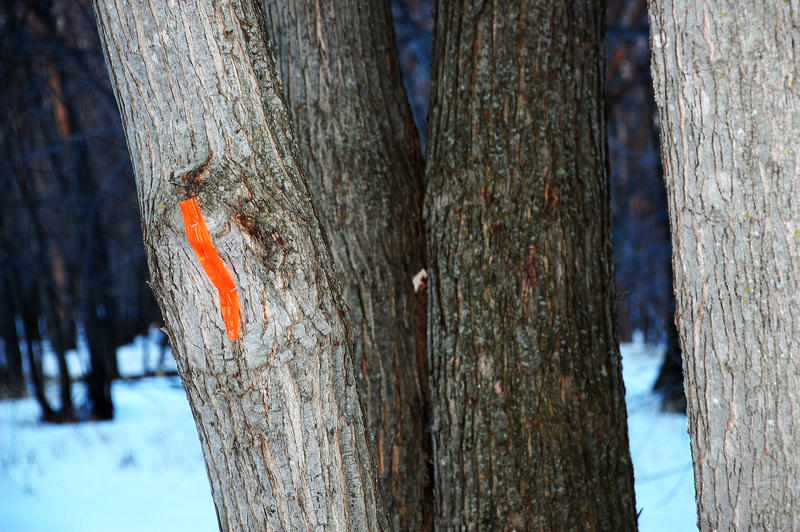 Sadly, our tree-tapping experiment had gone awry. The river has already flooded, a little earlier than usual. 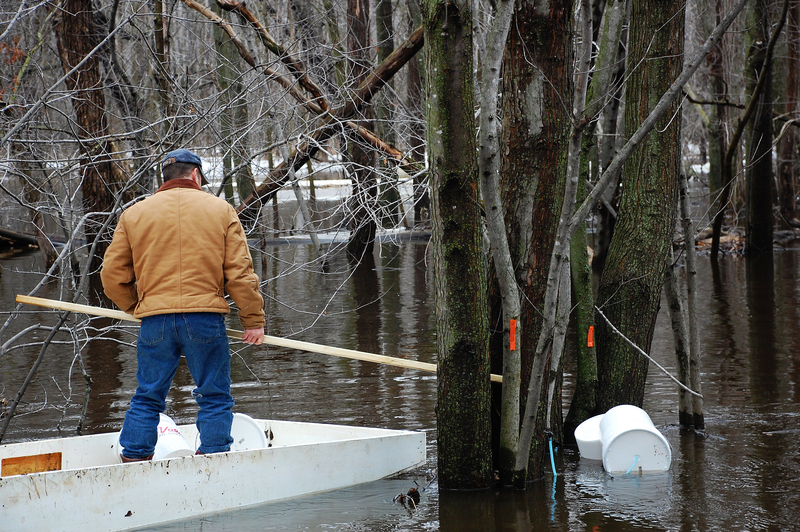 The flood waters have interfered with our first attempt to collect the sap out of the maple trees. 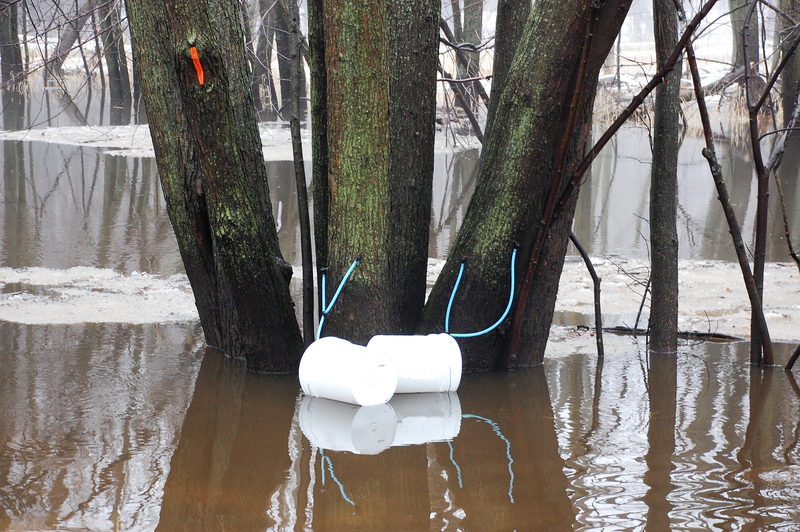 Instead of sitting safely next to the tree, the collection pails are floating in the swollen river. We need a new plan. 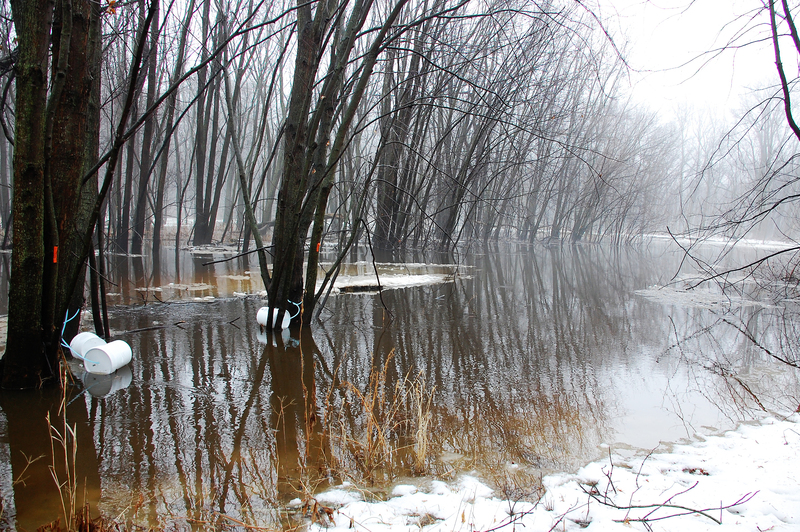 Despite my frustration over the floating pails, I do find the flooded river bottom eerily beautiful. Wasting no time, Jesse formulated a plan to retrieve the pails. Using the scow boat, he floated out to the pails and gathered them up. 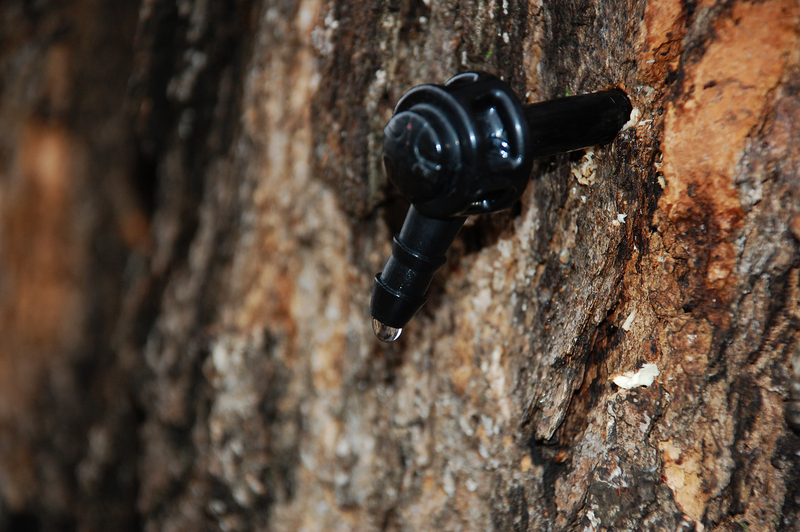 We located more maple trees on higher ground behind the house and drilled new holes for the taps. 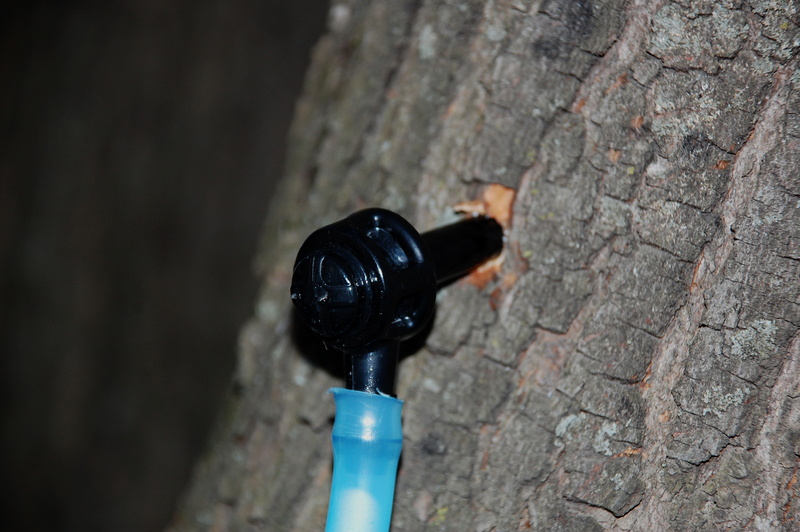 Once the spiles were inserted, some sap started dripping out. We were so excited!! So excited that our daughter did not want to see it go to waste. She said that it only has a hint of sweetness.